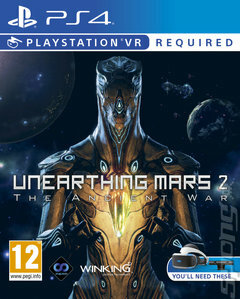 Unearthing Mars 2: The Ancient War takes its predecessor's most loved feature - a final stage featuring wave after wave of enemies to be shot down - and builds it out into a fast-paced arcade shooter that makes use of PSVR. You play as the deputy commander of the 'Unearthing Mars' mission, hoping to unearth the secrets hidden in the Phobos Fragment. What follows is a wild ride into a war across outer space in the deep past of Mars and Earth. In practical terms, that means you're going to have a LOT of aliens to shoot and some handy superpowers to help you out. The one you'll draw on most is a bullet time mechanic that enables you to slow things down around you and target multiple weak points on enemies. It comes with a cool down though, so don't expect this to be a cake walk. Punctuating the endless waves of enemies are some epic boss fights against powered up behemoths and gigantic automatons. Movement is handles using teleportation, so issues with queasy stomachs are avoided and you can get on with the business of shooting aliens. Unearthing Mars 2: The Ancient War is an out-there sci-fi game that doesn't pull any punches when it comes to speed and action.